Cupcakes 'n Daisies: Ashcombe Headway . . . . 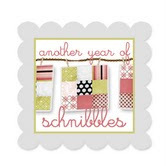 So I'm still working away on Ashcombe by Carrie Nelson for Miss Rosie's Quilt Co, and just loving it. One reason I'm enjoying this project is that I'm sticking with the pattern, no added "Thelma Drama" due to changing the pattern, adding a new pattern to the existing pattern, resizing or supersizing...I'm just letting Carrie drive this bus and I'm along for ride. I'm using Simple Abundance by Bonnie and Camille for Moda. 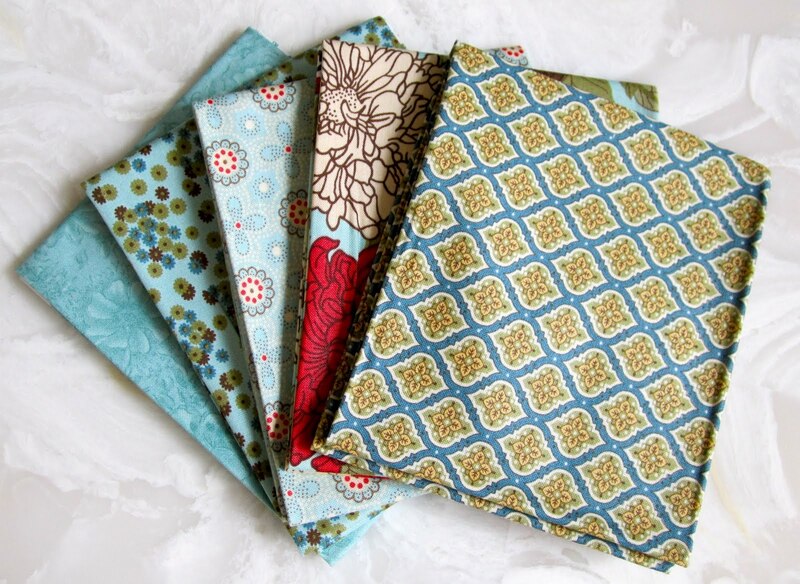 I didn't take to this fabric when it first came out, and even after I bought my fat quarter bundle, I had my doubts as to how much I would like a quilt made with this family. I kept seeing so many lovely projects online made from this fabric that I figured I couldn't go wrong. I am so envious of you quilters who can look at fabric, immediately fall in love with it, and know it will make the most beautiful quilt. Usually, by the time I figure out I like a fabric, it's all sold out! Here's the background fabric I'm using . . . It's not part of this family, but it's a perfect match. I think greens are the hardest colors to match....there are so many shades of green. But I got lucky with this one, it's the perfect combination of complimenting the fabric, not over powering it, and it's not so plain that it makes the quilt top look flat. I pulled the pinks . . .
and blues from this family, they'll make it into something else. That left the yellows, browns, reds, greens and oranges to work with, a perfect early spring or early fall color palette. 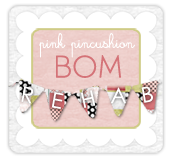 it was made with Simple Abundance, the pinks and blues are in her version. This quilt was pieced for Carrie by Carol, at Brown Quilts, and beautifully quilted by Darlene, at Quilting Daze. I really liked the stripped piece version of Ashcombe, but I wanted to showcase the fabric a little more, so I decided to go with this version of Ashcombe. 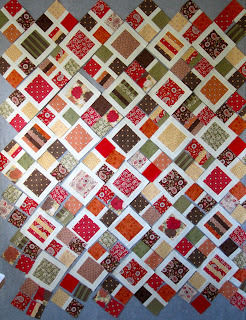 This quilt was pieced and quilted for Carrie by Darlene, at Quilt Daze. So here's a sample block . . . 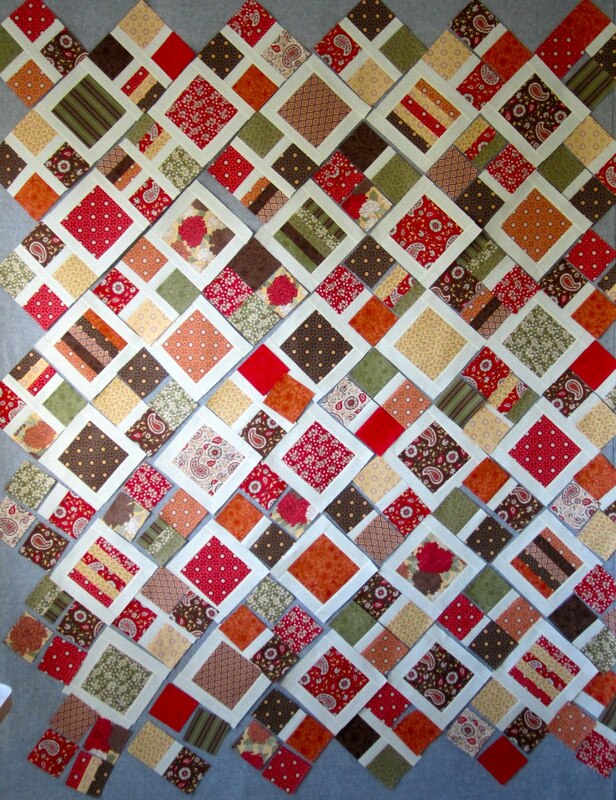 I decided to add a few of the stripped pieced blocks for interest. The perfect solution given I was limiting myself by removing the pinks and blues from the family. and threw them on my design wall. All that's left is to quit rearranging them and sew them together. I have this thing about like fabric touching in a scrappy quilt....it drives me insane when that happens!! But I rearranged them for the 10th time before I went to bed last night, and took a quick peek first thing this morning, I think I've found the perfect place for each block!! Your version of Ashcombe is fabulous, Thelma. I absolutely love Simple Abundance and I'm glad that you do, as well. I love what you've done with the Simple Abundance.I fell in love with it the moment I saw it. It was extremly hard to find where I live because nobody was carrying it in their shops. I'd died to get a fat quarter bundle but I ended up with a jelly roll and layer cake. It looks great, Thelma! I have a layer cake of SA that I've not used yet - but i do love it so. Omg! I HATE when like fabrics touch in 'scrappy' quilts. It has to be organized chaos. Love Simple Abundance. It was a beautiful mix of all the right colors and patterns. I'm feeling a little left out on the Bliss line but i'm not as in love as I was with SA. Ashcombe is coming along beautifully. Ok, now I think I am going to work on my version of Ashcombe today! No excuses! Perfect! Creating is such a fun process. That is going to look so beautiful! I love the layout! Those blocks are gorgeous! 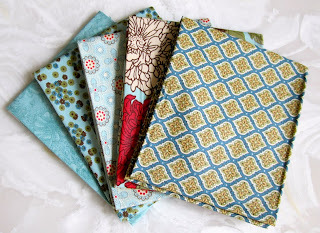 The setting triangles will be a piece of cake... and your quilt will be amazing! Looks great and fun to make! I know what you mean about it being relaxing just to follow the pattern and not change things...unfortunately the last time I did that, there was an error on the pattern, and I followed right along! hah I also hate when like fabrics touch--sometimes arranging them takes longer than stitching them, but they must be kept apart! Gorgeous blocks! Your version looks so vibrant! Happy stitchin'! Your blocks are looking good, Thelma! It was a good decision to take out the blue and pink. I really like the colors that you are left with. I'm sure this will be one of your favorite quilts. While I love the Thelma Drama I do like those fabrics in the pattern as is. I really enjoy seeing your process of fabric selection and changing up the pattern. Your version of this quilt is wonderful! oh yeah - it is looking Not Too ... just the right amount of strips vs. no strips ... Not Too plain and Not Too out there! I love your comment about "Thelmasizing" a project. I did that with a couple of projects. It was so easy the next couple of times to just follow the pattern. I do like how you put the strings/rails into your version. How did your setting triangles go together? Take care!